01/15/2018 9:00 AM PST - 01/26/2018 2:07 PM PST CLOSED! 7.7. Except as expressly provided herein, Prop Store and the Seller shall have no liability to any Bidder or Buyer with respect to any Lot and all and any implied warranties and conditions are excluded to the fullest extent permitted by law. 7.9 Each bidder acknowledges and agrees that the technology and the website provided by prop store in connection with the auction is “as is,” without any warranties of any kind and that prop store does not represent or warrant that the technology or the website will be uninterrupted or error free. Each bidder acknowledges and agrees that the prop store shall have no liability, responsibility or obligation for any claim, demands, causes of action or damages of any kind arising out of or relating to any interruptions or errors in the technology or the website offered or utilized in connection with the auction. 7.10 Bidder/s (including browsing) of this auction is at Bidder’s own risk. Neither Prop Store nor any other party involved in creating, producing, or delivering this listing is liable for any direct, incidental, consequential, indirect, or punitive damages arising out of your access to, or use of, the site. Prop Store also assumes no responsibility, and shall not be liable for, any damages to, or viruses that may infect, Bidder’s computer equipment or other property on account of Bidder’s access to, use of, or browsing in the Site or Bidder’s downloading of any materials, data, text, images, video, or audio from the site. Prop Store’s “Gods of Egypt” Registration Giveaway (hereafter, “Promotion”) is open to anyone who is eighteen (18) years of age or older, or the age of majority in their place of residence, whichever is older, as of the date of entry. Void where prohibited or restricted by law. Officers, board of directors, employees, representatives and agents of The Prop Store of London, Inc., Summit Entertainment, LLC (“Summit”), and their respective subsidiaries, affiliates, owners, shareholders, officers, directors, agents, representatives and employees, and the immediate family members (parent, spouse, child, or sibling, and their respective spouses, regardless of where they reside) of such officers, directors, employees, representatives and agents, and those living in their same households, whether or not related, are not eligible to enter or win any of the available prizes (the “Prizes”). All applicable country, federal, state and local laws apply. Summit is not responsible for the collection, submission or processing of entries, the administration of the Promotion, the selection of winners or the fulfillment of prizes. Promotion begins 12:01:00 am Pacific Time (“PT”) on _December 20, 2017 and ends on or about _09:00 am PT on _January 14, 2018 (the “Promotion Period”). Entries submitted before or after the Promotion Period will not be eligible. 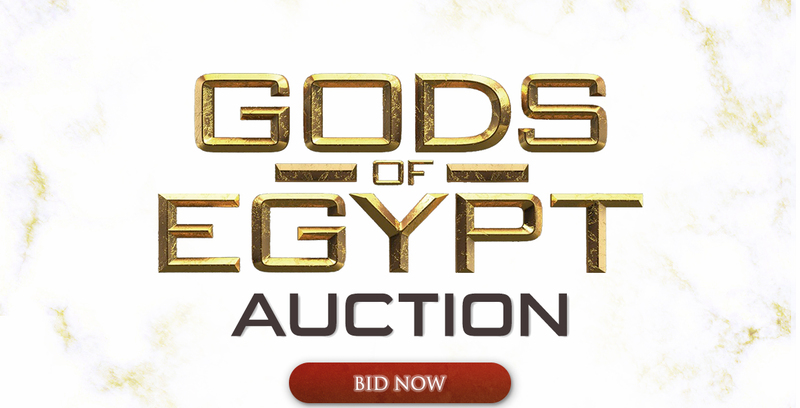 All entrants who register to bid in the “Gods of Egypt” Auction to be held by Prop Store on _January 15, 2018 to _January 26, 2018, will automatically be entered in the Promotion. If you do not wish to be entered in the Promotion, please check the appropriate box during registration to opt-out of entry. Until the commencement of the “Gods of Egypt” Auction on _January 15, 2018, one (1) winner will be selected in a random drawing conducted each week on Wednesday at or about _1:00 pm PT from among all the valid entries received. Prop Store will announce the winning entry via e-mail. The use of script, macro or other automated devices such as bots (or any other devices intended to automate or subvert any aspect of entry) to participate in the Promotion is prohibited and any entry through such means and any entry that is deemed to be ineligible (at Prop Store’s sole discretion and in accordance with these Official Rules) will be void. In the event of a dispute as to the identity of an entrant, the entry and prize will be awarded to the individual assigned to the email address used to register for the “Gods of Egypt” Auction, provided such individual is eligible according to these Official Rules. Released Parties are not responsible for late, lost, stolen, incomplete, misdirected, delayed, garbled, damaged entries or for telephonic, human or computer failures, problems or errors, interruptions in service due to system upgrades, repairs, modifications or other causes, failures or malfunctions of connections, satellite, network, cable, Internet Service Provider (ISP), phones, phone lines or telephone systems, traffic congestion on the internet, technical or mechanical malfunctions, or other malfunctions or errors, whether caused by equipment, programming, human error or otherwise relating to or in connection with the Promotion, including, without limitation, errors which may occur in connection with the administration of the Promotion, entries, or the announcement of the prize; or for any injury or damage to entrant’s or any other person’s computer relating to or resulting from participation in this Promotion, or for printing, typographical, human or other errors appearing in these Official Rules or other Promotion-related materials. Prop Store reserve the right, in their sole discretion, to: 1) disqualify any entrant and void any entries of entrants who it believes have attempted to tamper with or impair the administration, security, fairness or proper use of this Promotion or are in violation of these Official Rules; 2) modify, terminate or suspend this Promotion should unauthorized human intervention or any other causes corrupt or impair the administration, security, fairness or proper use of the Promotion, or for any other reason, as determined by Prop Store in its sole discretion.